Care for You have been established since 1998 and supply high quality home care and support to individuals living in their own homes. We offer a wealth of experience, and are experienced specialists within the health care industry. We have been Registered with CQC formerly (CSCI) since 2004, and are members of the United Kingdom Health Care Association (UKHCA). Our experienced support workers make a huge difference to the lives of older people, infirm and disabled both in the home and elsewhere. 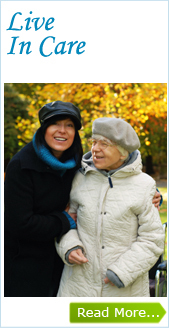 We provide professionalism, value and a passion for caring which sets us apart from the rest. We have built a large client base which includes both social services departments and private individuals. 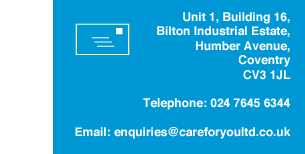 Care for You provide experienced caring professionals who take great pride in making a difference to people`s lives so if you require help around the home or elsewhere please contact us on 024 7645 6344.